Special acknowledgement to members who show their guns. were most of the pictures were taken. The first submachine gun was constructed in Germany. It was called model 1918. It was a typical close quarter weapon, intended to be used for short range in the trenches of the Great War. The weapon should have a two man crew – one shooter and one to carry the ammunition. In the near time after the war the US general John T. Thompson constructed a model which became famous because of the gangsters. 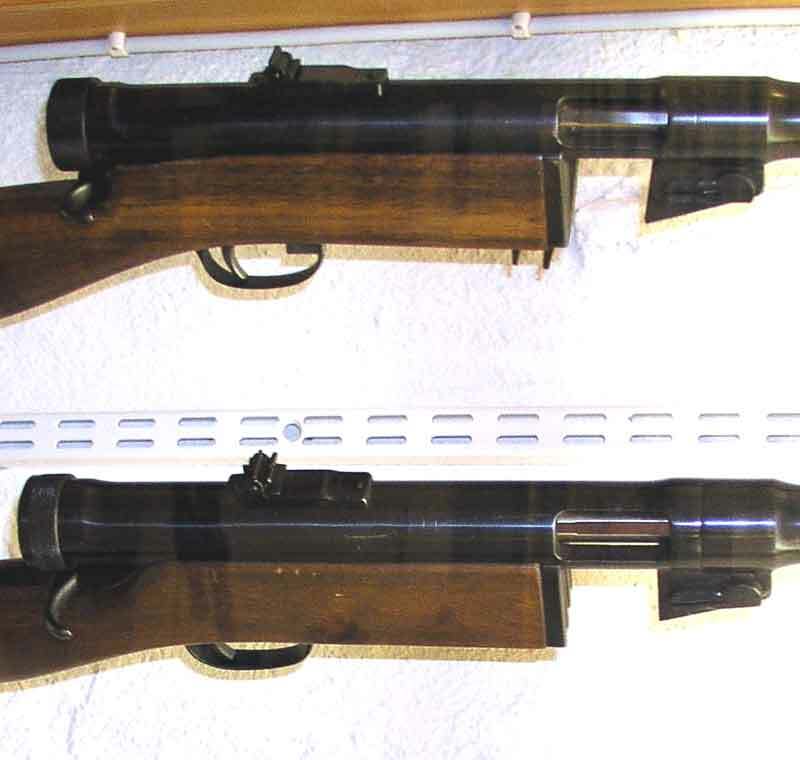 These first submachine guns were heavy and very similar to carbines. After 1935 Sweden started to rebuild its military force. The army started to search for a suitable submachine gun. 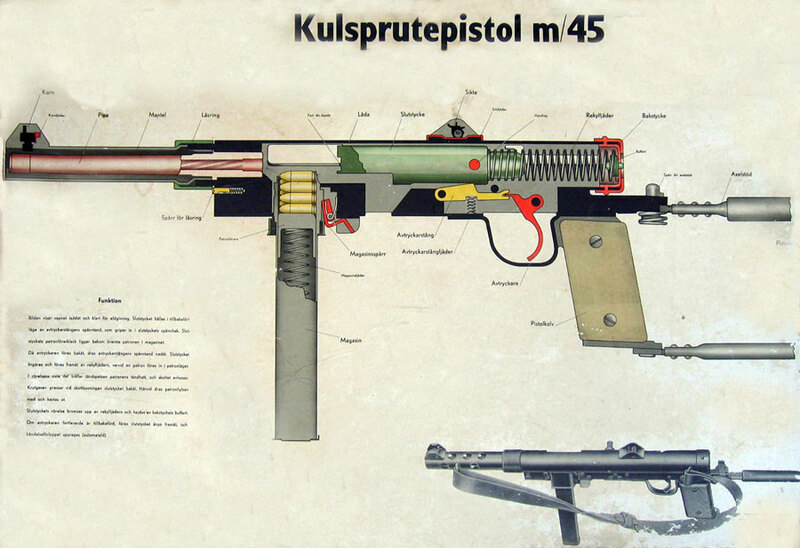 Submachine gun is called “kulsprutepistol” (machinegun pistol) or short “kpist”in Sweden. The Finnish company Tikkakoski in Jyväskylä had constructed a robust and reliable submachine gun. 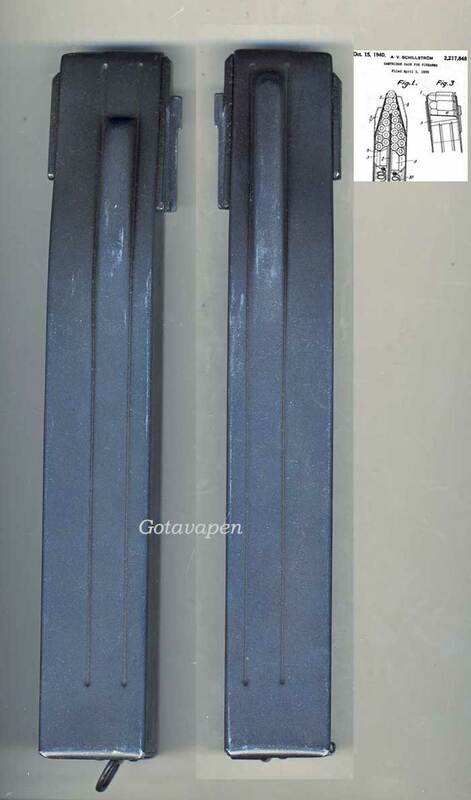 In Carl Gustavs Stads Gun Factory in Eskilstuna a stick magazine for 56 cartridges had been produced. This was the first version of this mag. The Swedish pistol ammo was packed in boxed of 28. The magazine took 56 equal to two full boxes. Manufactured by Husqvarna Gun Factory under license from Finland. Cyclic rate 900 shots / min. To the left you can see a copy of the Swedish manual. 9 mm Browning long called 9 mm m/07. It was intended for the Swedish pistol m/07. The disadvantage of this cartridge is that it has a semi rim and beside it is not very powerful. The semi-rim cartridges have to be lined up behind each other in the magazine for proper feeding of the gun. This resulted in that the magazine was tilted backwards and mounted this way in the machine gun. Above: Here is a comparison between m/37 and m/37-39. 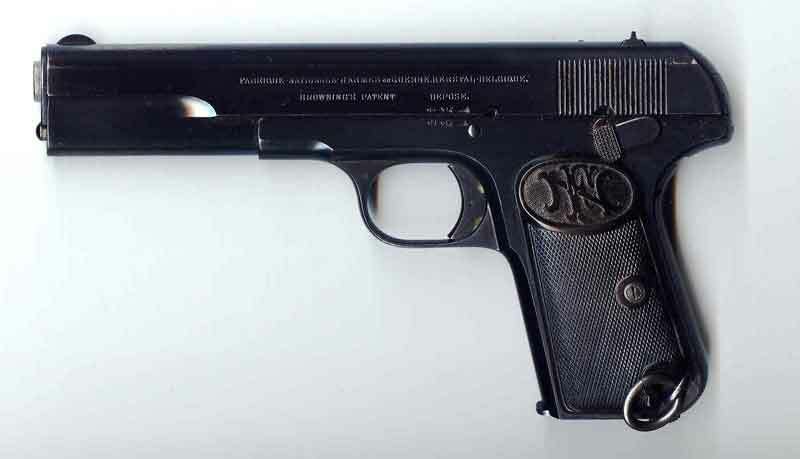 Above: Pistol m/07 made by FN for the Swedish Army 1910. Calibre 9x20 mm Browning long. 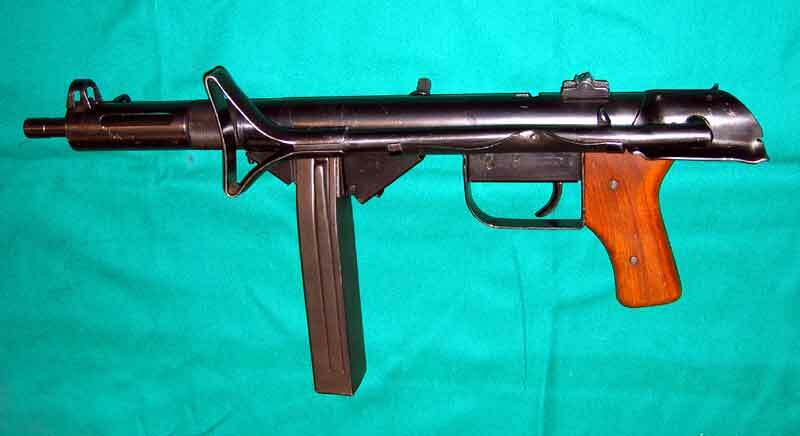 The Finnish submachine gun was constructed for 9 mm Luger (Parabellum) round. It has no rim and feeds easily in magazines of many types. This cartridge is more powerful than the m/07. 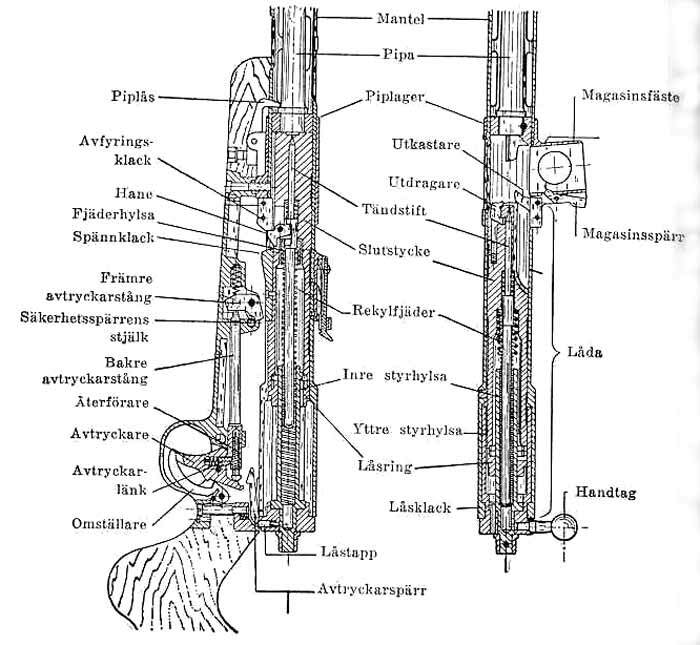 The Swedish force was not happy to introduce a second pistol cartridge. It would be too expensive. Beside there was a risk for mixing the two types. The first numbers of submachine guns m/37 were made in Finland. The Tikkakoski arsenal was not happy to produce a weapon deviating from their original. The problem was the tilted magazine. They had to have two set of tools, one for the Swedish gun and one for the Finnish gun. They recommended the 9 mm Luger cartridge heavily. 1939 the war came closer and the demand for weapons were urgent in Sweden. The total number of m/37 submachine guns in the Swedish Army in 1939 was as low as 900! Now Sweden bought 1800 submachine guns from Germany. This was the Bergman model 1935. 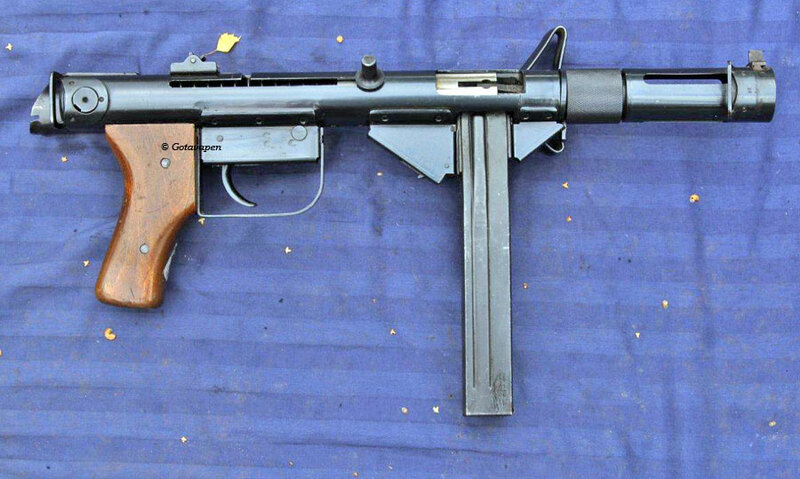 This submachine gun was unlike earlier Bergmann submachine guns not designed by Hugo Schmeisser. This is model 1935/1 and it was made with both long and short barrels. The prototypes for this gun were made in Denmark 1932. This invention became Bergmann M34/1 which after some modifications became M1935/1. It was made by the Walther Zella Mehlis plant for Sweden. Later during WW2 the same gun was made by Junker and Ruh. It was used by SS during WW2. 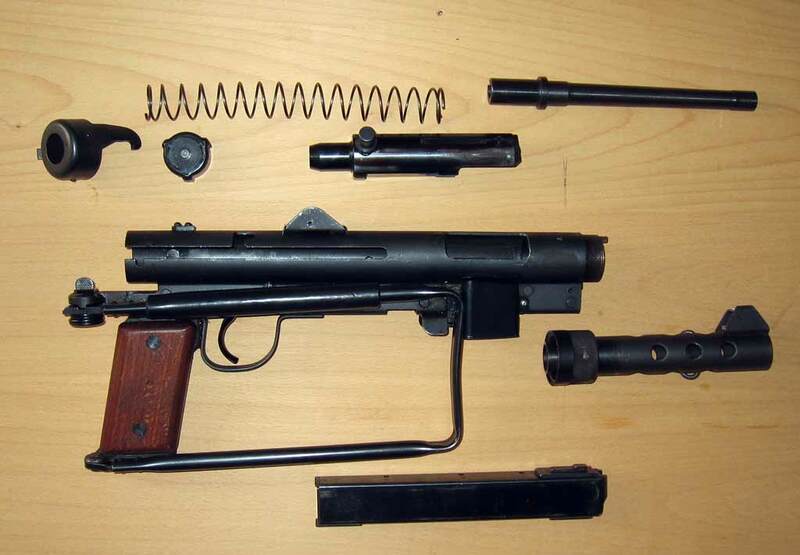 Together with this submachine gun 1500 Walther pistols model HP were bought. These weapons used the German cartridge m/08 equal to 9 mm Luger cartridge! This new cartridge was named m/39 in Sweden. Above submachine gun m/39. Sweden bought both a long and short model from Carl Walther Z-M. Above you can see the Swedish Submachine gun m/39 field stripped. Below you can see one drawing of the same gun. Pictures from the Swedish Army. Sweden bought both a long and short model from Carl Walther Z-M.
Cyclic rate 700 shots / min. Cyclic rate 700 shots / min. Now the calibres for the submachine guns were changed to 9 mm m/39. 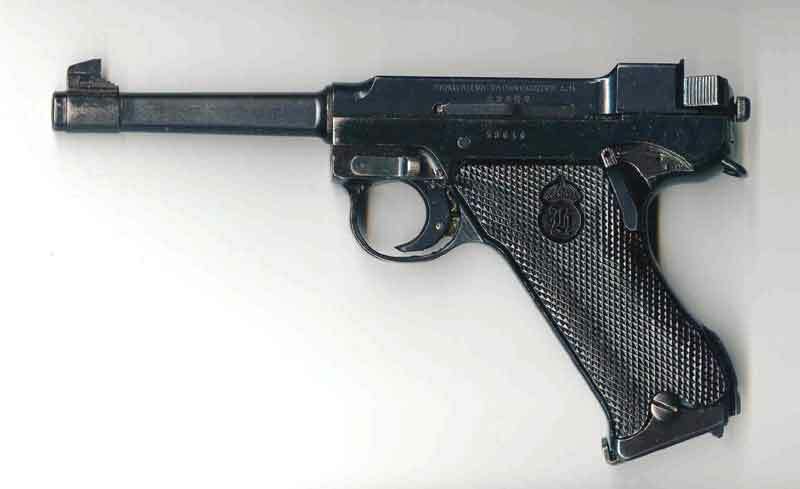 Husqvarna Gun Factory changed their production of m/37 in 9 mm Browning to 9 mm Luger. The new model of the submachine gun was named m/37-39. 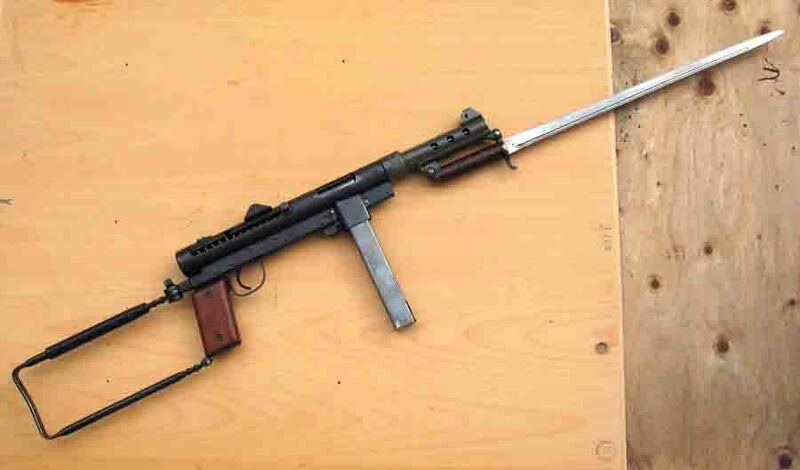 The submachine gun can shoot both semi automatic fire and full automatic. The switch is in front of the trigger guard. In the rear position (like the picture) the gun is in safe position. The middle position for semiautomatic and forward position fires full auto. The sight is adjustable for 100 m, 200 m and 300 m.
a) m/37 fires 9x20 mm Browning while m/37-39 fires the 9x19 mm Luger cartridge. 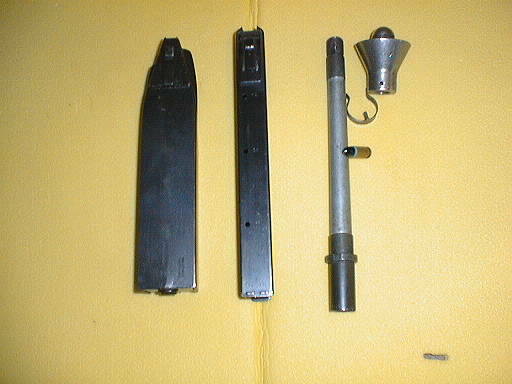 b) Magazine is straight on m/37-39 and takes 50 cartridges and is inserted at 90 degree into the gun. 35.000 submachine guns of m/37-39 were manufactured in Husqvarna Gun Factory under license from Finland. To have enough of submachine guns another 500 guns (Kulsprutepistol Kp-31) were bought from Finland and they are called m/37-39F. A small number were produced by “Husqvarna Vapen Fabrik” (HVA Gun Factory) for more secrete purposes. They were some produced without the name of the manufacturer. 1943 the Swedish government started to give military training to selected refugees from Norway and Denmark. 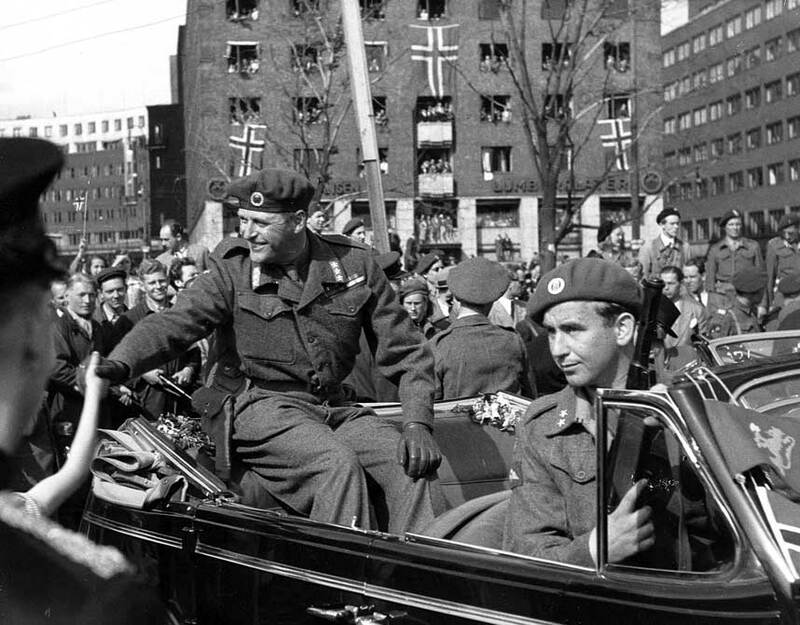 It went faster to establish something called “Police units” from Norway due to the connections with the Norwegian exile government in London. These units were equipped with handguns like Submachine gun m/37-39 and pistols m/40 without any marks. These weapons were named “Neutral” guns at the factory. Later investigations have shown that these guns were ordered by a company called Skandiastal AB (which means Scandia Steel Co.). This company was a dummy company owned and run by the Swedish Secrete Service called “C-bureau” during WW2. 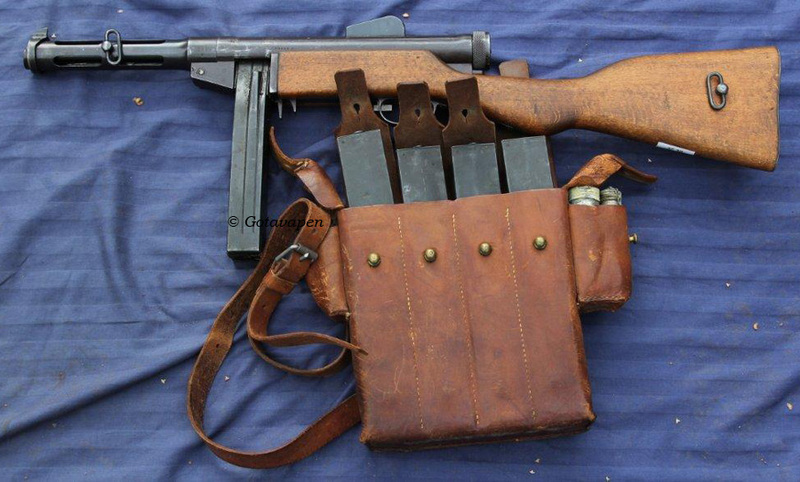 Here is such a Husqvarna Submachine gun m/37-39 from Norway without the name of manufacturer. January 25, 1940, The Royal Swedish Army ordered 500 Thompson Model of 1928 A Submachine Guns from an authorized agent of the Thompson Automatic Arms Corporation, the AB UNO Lindholm & Co. Documents show that they had an option for another 3000 guns but it was never used. Sweden was one of the first countries in Europe to adopt the Thompson. 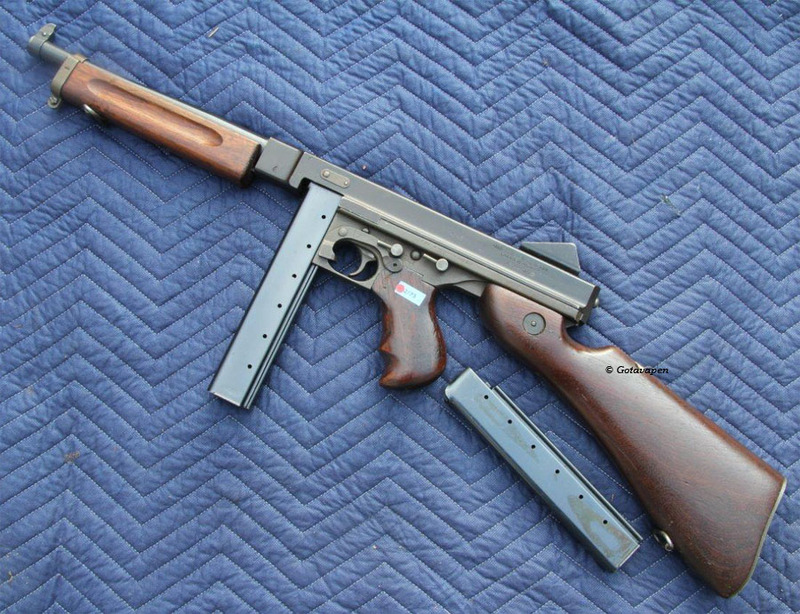 The 500 kpist m/40 or Model of 1928 Thompson’s are what is referred to in Auto-Ordnance sales literature and catalogues as the Model of 1928A which isn’t fitted with a compensator. The lack of a compensator is almost unique for the Swedish Thompson. It is a very rare configuration. Even more odd is that they are actually Thompson 1921 and not 1928! 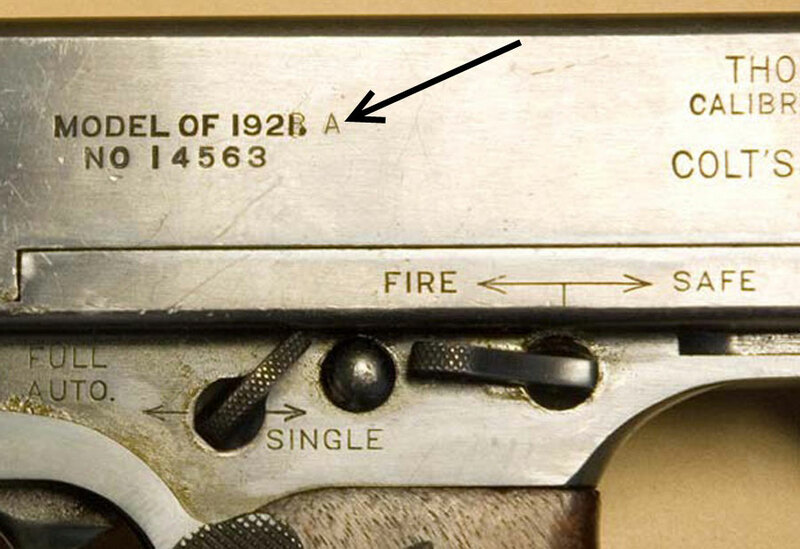 It is clearly visible on the remaining m/40 submachine guns that they are stamped 1921 and later re-stamped to 1928A. The digit 1 has been changed to 8A! Kpist m/40’s were issued primarily to the 1st Military District with Headquarters in Kristianstad in Southern part of Sweden. Infantry regiments I6 Nothern Skanska, I7 Southern Skanska and I16 Hallands Infantry Regiments were issued the kpist m/40. The Swedish weapon kpist m/40 has an adjustable rear sight in meters! The front handle follows the barrel. Each gun was supplied with four 20 shot stick magazines and one 50 shot drum magazine. Colonel (ret.) 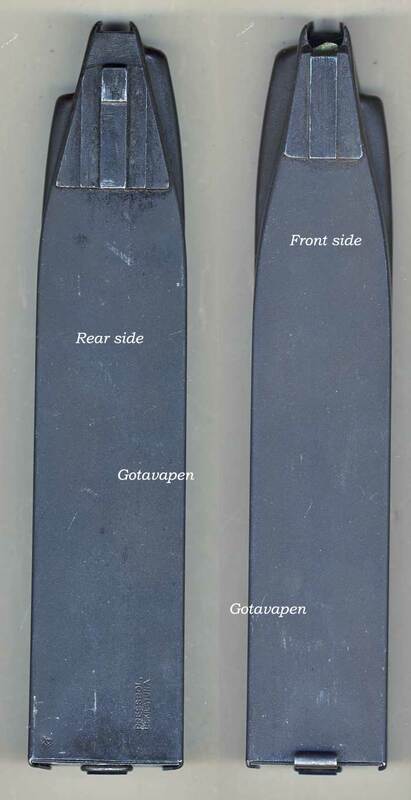 Stellan Bojerud reports that kpist m/40 was used on May 21, 1940 when a meeting took place in Storlien in Sweden between German GOC (General Officer Commanding) Norway, Colonel-General Nicolaus von Falkenhorst and Swedish Supreme Commander General Olof Thornell. The meeting was held in von Falkenhorst’s railway car on the Norwegian side of the Storlien Border Station. In an effort to impress the Germans the body guards of General Thornell were all armed with Thompson Submachine Guns. This cartridge (11 mm patron m/40) was a stranger in the Swedish armed forces and was never produced here. Kpist m/40 became soon surplus for Swedish military needs. It was eventually issued to second line units. It is known a Landstormen Infantry Regiment (I181) based on the island of Oland, was issued the kpist m/40. After that, nobody knows for sure what happened to these guns. According to Major (ret.) Carl-Olof Bjorsell the Swedish Thompson’s were sold to Israel during 1950:s.
Weight 4,8 kg Cyclic rate 600-700 shots/min. Sir Winston Churchill in the famous 1940 pose with a drum-magazine model of 1928 Thompson. The British were the first to use the Thompson in combat in World War II. It was favoured by the British Commandos. W.E. Fairbairn and Billy Sykes taught the "Steel hand from the sea" as they were called by Churchill, how to use the Tommy Gun. 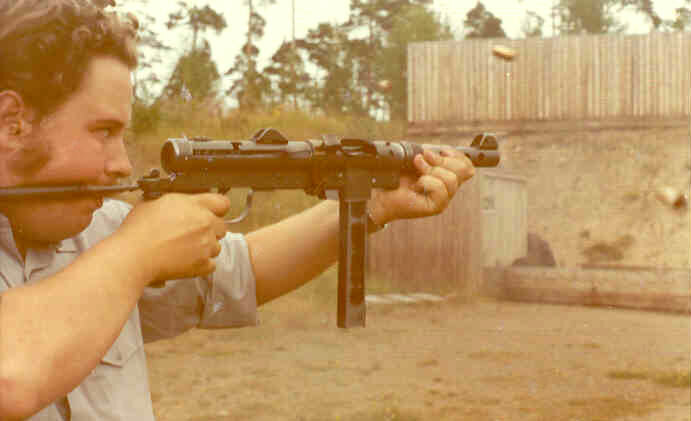 Sweden was one of the first countries to buy the Thompson M1928 and use it as Kpist m/40. The nations at war tried to simplify the production of arms. Weapons were made from pressed steel. Once again the Germans took the lead and produced 1940 their submachine gun MP40. The Soviet Union which had lost a great part of its manufacturing companies during the German assault 1941-42, managed to rebuild arsenals further east and constructed in very short period an easy produced submachine gun Ppsh41. The Red Army equipped entire battalions with these simple and reliable weapons in 7,62x25 mm. Development of a new submachine gun at the end of WW2. During 1939-1945 submachine guns were only issued to the squad leaders of riflemen and commandos. The machinegun crews and grenade launcher crews were also equipped with pistols. Other types of crews like for artillery were equipped with carbines m/94. Sweden needed to replace the pistols which were used at large extent in the army. We can understand this when we know that 84.000 pistols m/40 were produced during 1941-45. The pistol is a typical close quarter gun and it takes time to teach an ordinary soldier to handle it effectively and demands a lot of ammunition. It was important to increase the total fire power of the riflemen groups by introducing larger numbers of submachine guns. The equipment for the ordinary rifleman squad, beside the squad leader, was composed of rifle m/38, semiautomatic rifle ag m/42b and for each platoon a couple of light machineguns m/37. Trials for a new Submachine gun. Now the demand became eminent for cheaper guns. One was constructed at Carl Gustavs Stad arms factory in Eskilstuna. 10 FM44HVA were made here are two of them. Both Husqvarna and Carl Gustav managed well in the tests. Carl Gustav G-F had decided to by no means to let this affair slip away. After great efforts they got the contract. 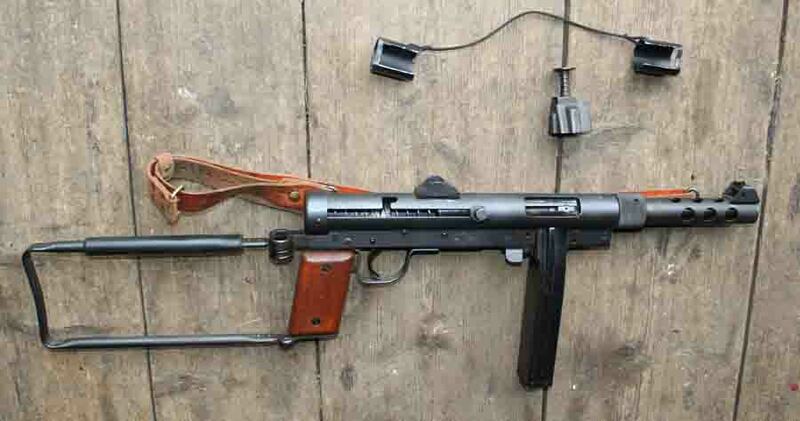 This weapon was called kpist m/45. The original can be seen here. Weight 3,5 kg Cyclic rate 700 shots/min. 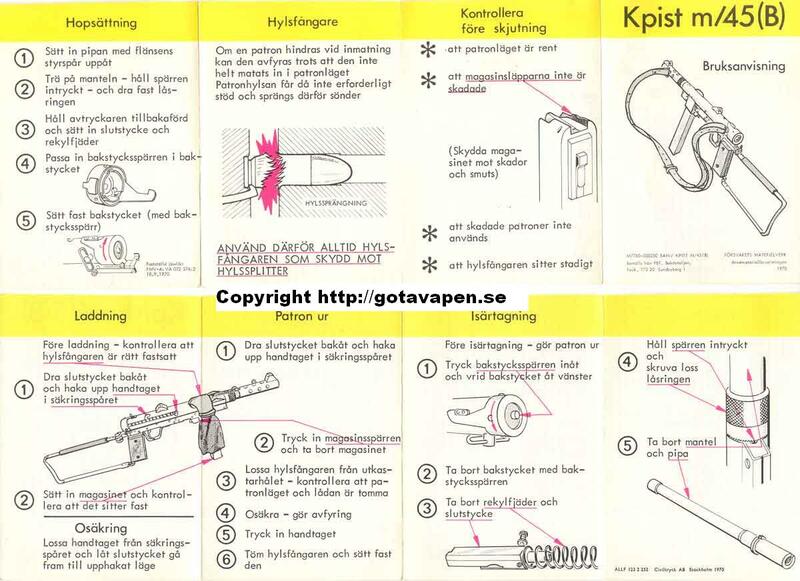 Above: Here we can see the first variations of the Swedish Submachine guns m/45. On top the first m/45 using the magazine of m/37-39. The m/45 was constructed by Gunnar Johnsson on the CG G-F. Note that there is no support for the magazine. Bottom - the first trial with the new 36 shot magazine. This is called FM45 JohVI constructed by Gunnar Johnsson on the CG G-F. Note the new type of magzine tied to the stock and the first support for magazine. 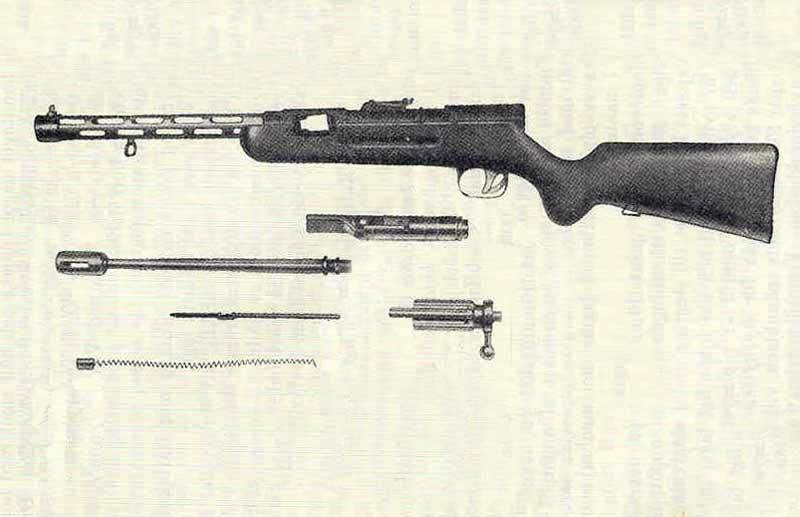 In the beginning the old 50 shot stick magazine for m/37-39 was used in the new gun. This magazine had some drawbacks. If it was not loaded properly it could cause malfunctions and it took time to fill up. 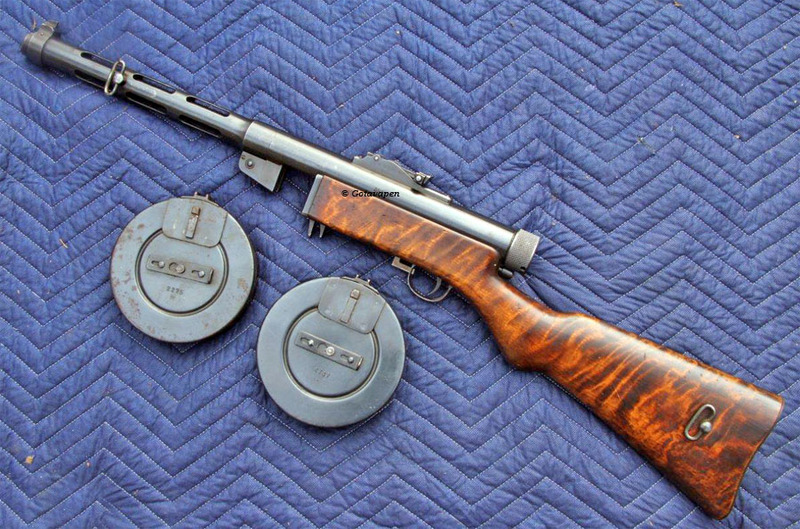 Even the drum magazines for m/37-39 could be used. 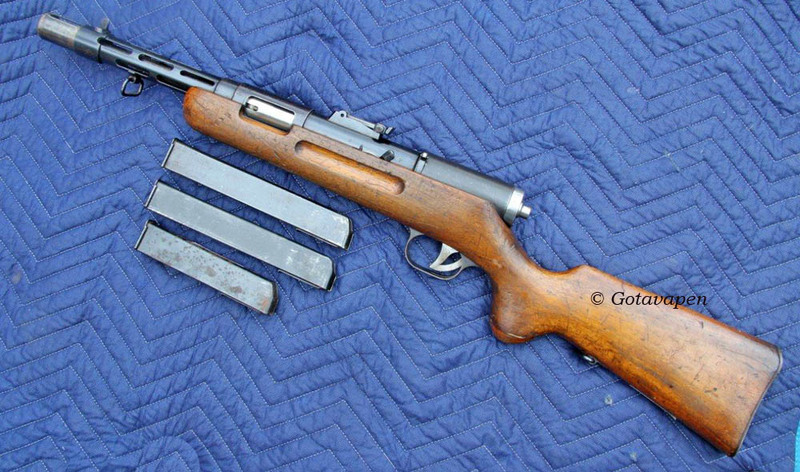 The kpist m/45 was constructed by Gunnar Johnsson at Carl Gustav G-F. The weapon fires full auto only. If the trigger is released fast it will fire single shot due to the slow cyclic rate of fire. Significant for the early m/45 is also the bigger holes in the protection surrounding the barrel. The gun is made safe by hooking up the bolt like many other early submachine guns. The rear sight has three blades 100 m, 200 m and 300 m like the m/37-39. The front sight is adjustable for both windage and elevation with a special tool. The Swedish submachine gun m/45b is very easy to handle. It is very accurate out to 200 m and it is easy to handle during full automatic fire, due to the rather slow rate of fire. 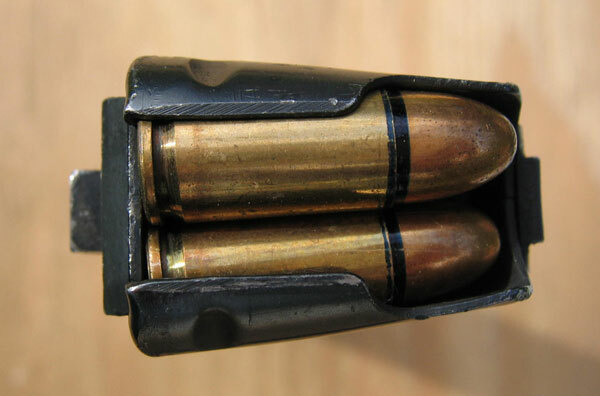 If a full 36 shot magazine is fired full auto it is only the third shoot which tends to slip out of a B2 (PPC target) at a distance of 50 m. The rest of the bullets will easily find their way into the target. As you can see on the picture the recoil of kpist m/45 is insignificant in full auto. The gun is very easy to control. A trained soldier can easily shoot 36 shots full auto in a man size target at 25 meters. Note two empty brass in the air. Author, many years ago, with Carl Gustaf submachine gun m/1945b under full automatic fire. Note 3 brass in the air. Weight 3,43 kg Cyclic rate 600 shots/min. Probably the best magazine in the world for 9 mm Luger. M/45 36 shot. 1945 a new 36 shot magazine was developed. It turned out to be one of the very best magazines in the world until now. It is wider behind and more narrow to the front. This construction allows the cartridges to move freely up and down independent of dust and below zero conditions. Magazines with parallel sides are very likely to jam under cold conditions. This, both Germans with MP40 and British with Sten-Gun, found out the hard way. 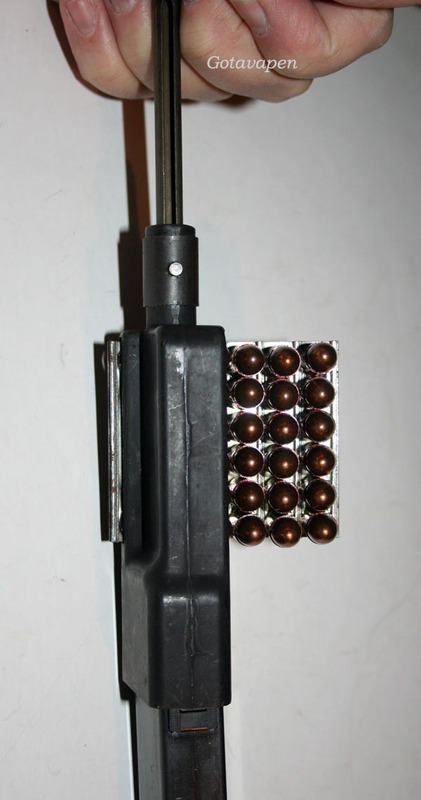 The m/45 magazine has double rows of cartridges and it is very easy to load by hand. With the help of a special tool a magazine can be loaded in 6 seconds. 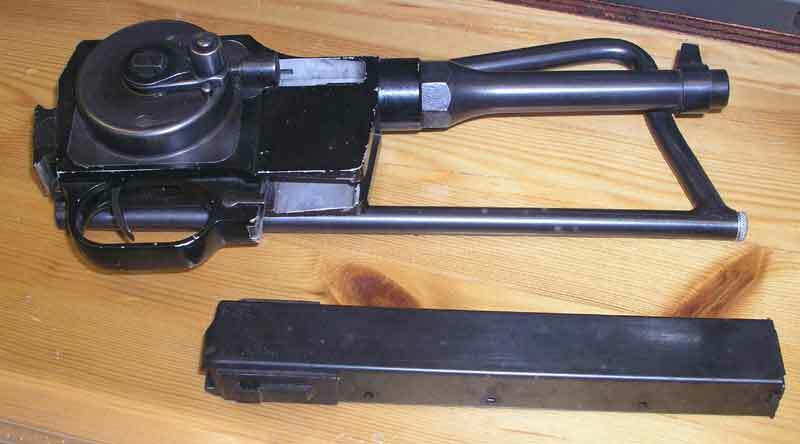 Loading device for m/45 magazine. It loads a full magazine in 6 seconds. Note the 36 shot clip for the rounds. Six hits on the handle and the magzine is fully loaded. Each row of rounds falls down in line of the device by the gravity. The rounds were put on 36 round clips with small locks in the both ends of each row of 6 rounds. These locks were smaller then the primer pockets. There were some accidents when a loaded clip was dropped on a hard surface. The lock hit the primer and there was an accidental discharge. when the round exploded. 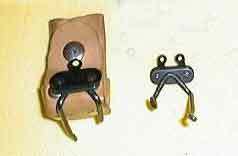 The clips were later altered to be with wider locks. Above to the left old type of clip. 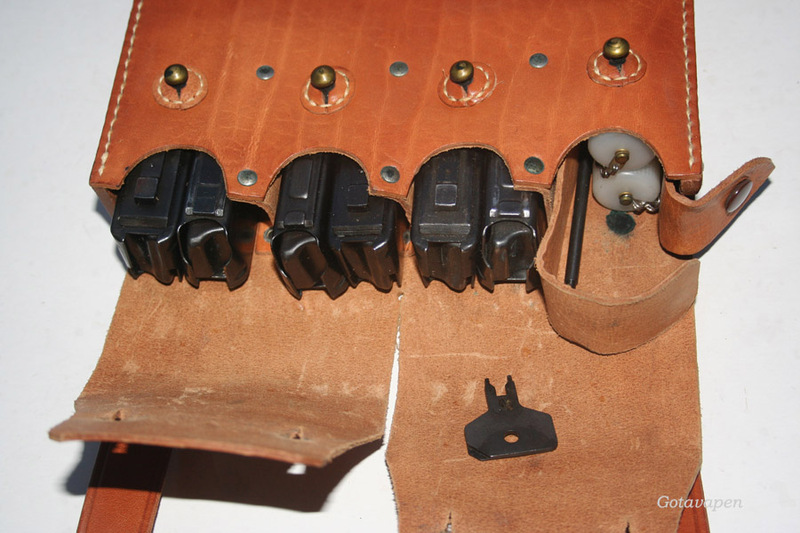 Above to right the new type of clip with wider locks for the rounds at each row. 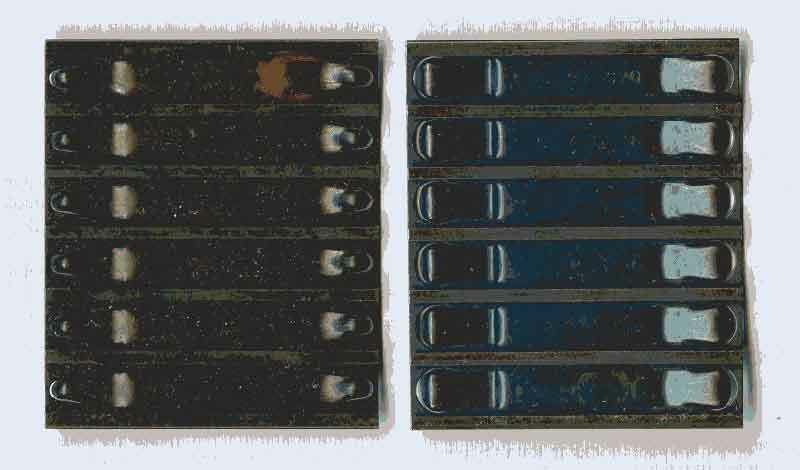 There are three holes in the rear of the magazine so the soldier can estimate how many rounds he has left in the magazine. Several weapons are using this unique magazine. 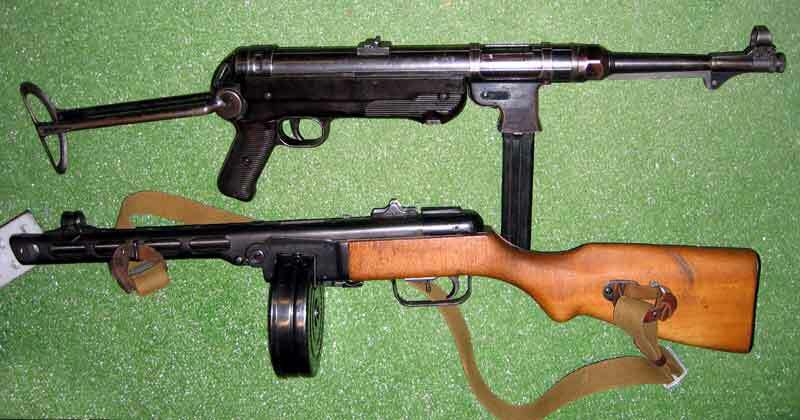 One of the best submachine guns in the world use it – the Czech model 23 & model 25. The French tried it also. Variations of Submachine gun 45. The early m/45 submachine guns were equipped with magazine support which could be removed by removing a clip.This invention was also made by Gunnar Johnsson. In this way the guns could handle both the m/37-39 50 shot magazine and the new reliable 36 shot magazine. Above you can see the Submachine gun Carl Gustaf m/1945S with the m/37-39 50 shot magazine. 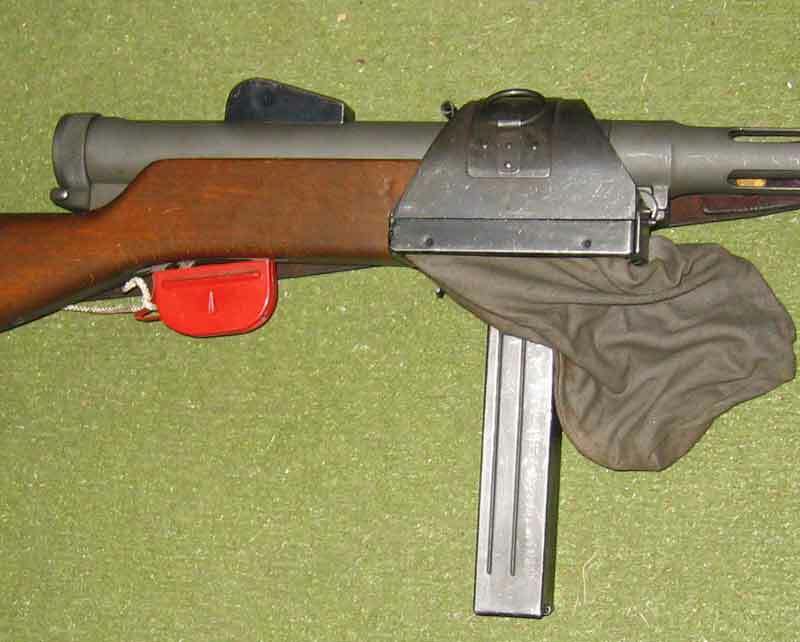 The 70 shot drum magazine (see below) for the m/37-39 could also be used. On top of the picture together with mag-loader are a loose sun protections for the front and rear sight. This is the last basic accepted military submachine gun in Sweden until now. There were concerns over the big holes in the barrel protection. It is claimed that they were easily bent. This was changed in next variation m/45b. 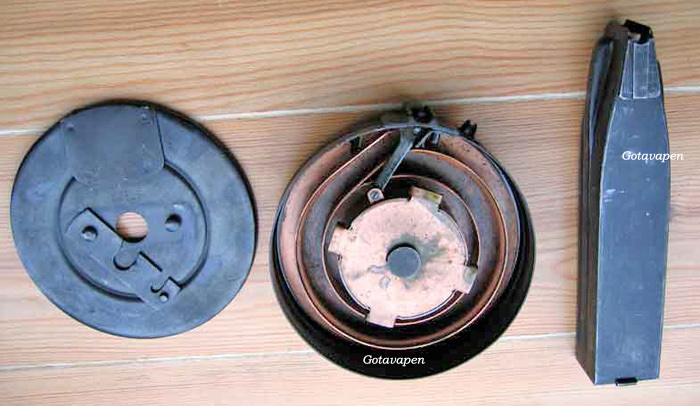 The rear buffer for the bolt was reconstructed to be stronger. It got an extra hook on top and a support in the lower part. It can be seen on the drawing below. The stripped submachine gun m/45B Click on the picture to see the full size. Weight 3,9 kg Cyclic rate 600 shots/min. A variation m/45C with special mount for bayonet exists for parades. Carbine bayonet m/94 is used. Here CG m/1945C with the long bayonet m/1915 from the navy. Weight 4,0 kg Cyclic rate 600 shots/min. Another rare variation is called m/45D. This is unique because it can shoot both semi-automatic and full automatic fire. Depress the middle bottom of the receiver cap (buffer). Turn the buffer slightly counter clockwise and cap will come off. 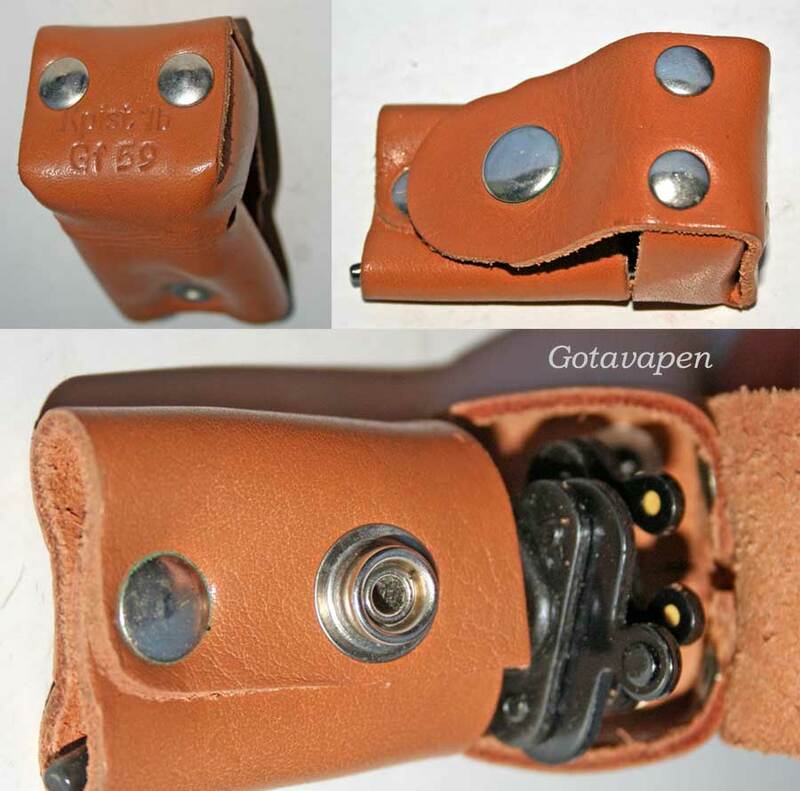 Push in on the barrel jacket nut catch with the key for the front sight or any screw driver. To reassemble, carry out in reverse the steps outlined above. The m/45 submachine gun fires from an open bolt. On pressing the trigger the heavy bolt flew forward, collecting a round from the magazine and chambering it. 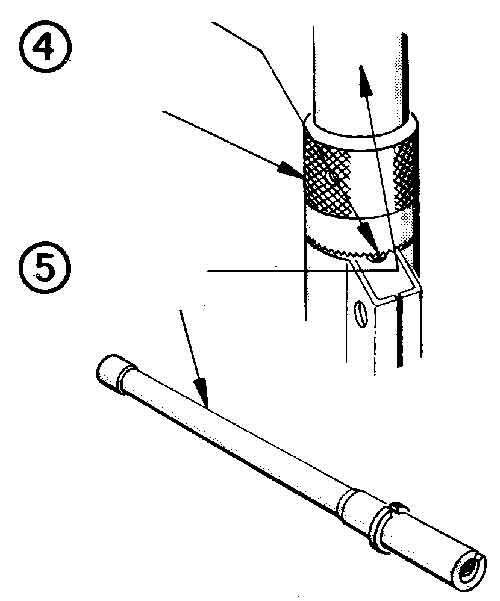 The resistance as the round chambered caused the firing pin, which is a part of the bolt, to impact on the cap, the round fired, the bullet departed, and t6he resulting reaction on the case pushed the bolt back. Owing to the bolts greater mass compared to the bullet it hardly begun to move before the bullet cleared the muzzle and the internal pressure dropped to a level where it was safe to remove the spent case. The energy injected into the case and bolt gave sufficient thrust to cause the bolt to fly back and complete the cycle. 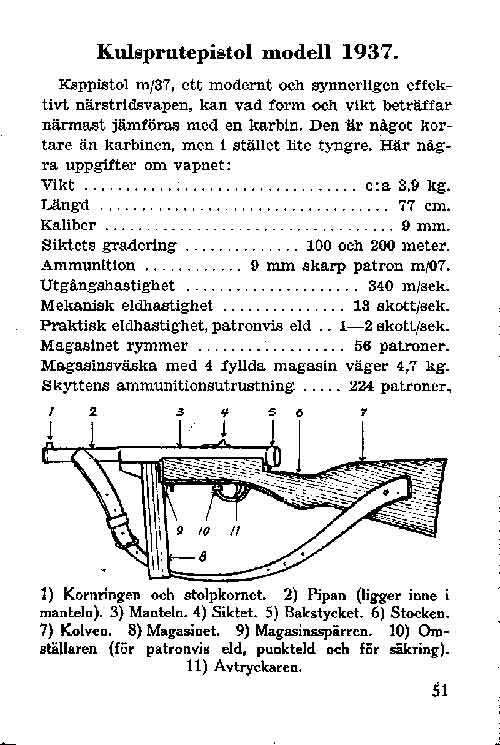 Development of ammunition for the Swedish submachine gun m/45b. We have already told about different questions and troubles for the different submachine guns of Sweden. The earlier models of guns became obsolete. The only remaining type of ammunition for submachine guns was the cartridge 9 mm m/39 which is equal to 9 mm Luger. It was used for both m/45 and m/45b and the pistol m/40. This was a conventional 9 mm Luger cartridge with soft jacket of copper over a lead core. Bullet weight is 7,5 gram (116 grain). 1947 Sweden started to seal the bullet and primer with paint. Prior to 1947 there was no seal. 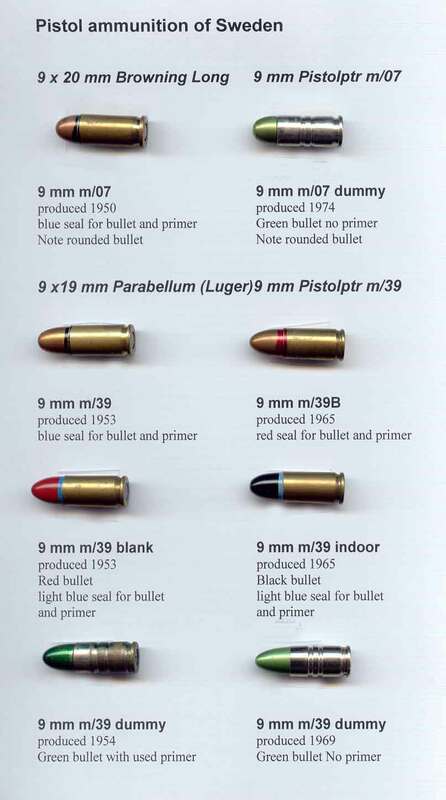 The m/39 pistol round has a blue seal for the bullet and the primer. The pistol round m/07 was still under production but only for the pistol m/07. The same system of seal was used. During the war in Korea, soldiers started to use so called ”bullet proof” west by introducing different types of lighter materials. This type of west became less heavy than the harnesk type from steel which was used during the Great war. When a bullet strikes a ”bullet proof” west the point of impact is deformed and the penetration ability is reduced. Swedish ammunition factories constructed a 9 mm bullet which was strong and less likely to deform on impact. The lead core was covered by a jacket of steel, thicker in the front. To reduce friction towards the barrel the steel was covered by a alloy of brass. This cartridge is called m/39B and can be recognized by its red seal for the bullet and primer. This bullet has very good penetration capability. US Army has shown interest in this ammunition and which have been sold to US recently even with an increased load. It has been prohibited in US for civilian use. 9 mm m/39B has been called cops killer by US police because its penetration capacity through a bullet proof west. After several years of trial finally a blank cartridge was constructed. The bullet is made out of red plastic with a cavity inside the bullet. This blank cartridge shall be used with a special barrel, which replaces the ordinary barrel for live ammunition, The barrel intended only for blank firing of blank shots and indoor cartridges has a calibre of 5,3 mm. 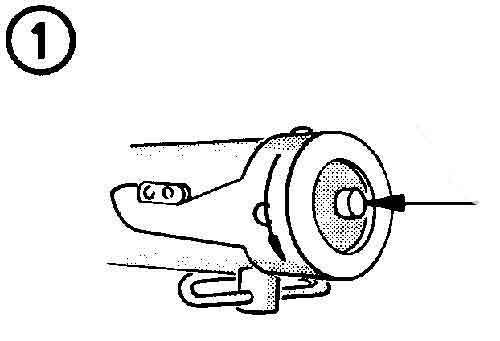 The plastic bullet is compressed into the barrel which causes the gas pressure to reach a level enough for the bolt to open and eject the spent case and to complete the loading cycle. The indoor bullet is black with a bullet of steel at the tip. This bullet of steel is round and welded into the plastic and weights 0,5 gram (7,8 grain). This round bullet fits to the inside of the blank firing barrel. The bullet trap is of course removed using indoor ammo. The non - corrosive primer were introduced to the Swedish armed forces 1950. The Swedish army stopped using the 9 mm m/39b 2003. Below the register of ammunition for the Swedish Army 1960. Accessories for the m37-39 and m/45. M/37-39 had four 50 shot magazines and device for loading them. These things were packed in a leather bag to be carried over the shoulder. There was no blank firing device for this gun. M/45: Six magazines are packed in a shoulder bag with oiler, cleaning rod, frontadjustment key and sometimes noght sights all in the same bag. During time of peace and training a special collector of brass is attached to the receiver. It also protects the soldier from injuries caused by exploding cartridges. Although it is rare it can happen and it is more frequent with blank ammo. This is due to that remains of waste from previous shots remains in the chamber. A special blank firing barrel is issued for m/45. It should be used with blanks (red bullet) and indoor ammo (black bullet). Using blanks a bullet trap is attached to the blank barrel. It is not used for indoor ammo. m/45 barrel for indoor shooting and old type blank firing with clip and bullet trap to the right. M/37-39 50 shot magazine seen from the side. Shortly after 1960 a simple type of sights for shooting in the dark was issued to the armed forces. These sights were issued for all types of hand guns except pistols. They were detachable front and rear sights with dots glowing in the dark. See picture beside here. A special red safety hatch for the ejection port was issued for guard service. 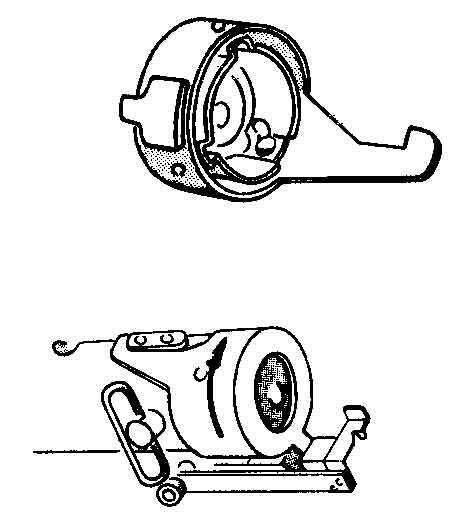 This devise was issued for m/45 and m/45B. The hatch blocks the forward movement of the bolt by mistake. The safety hatch should be applied before loading and be applied until the gun was cleared. If the gun should be used a fast pull on the strap connected to the safety hatch would remove it. The defence forces have stopped using the submachine guns nowadays because of the distribution of the assault rifle Ak5 became complete. Nowadays the introduction body armour among soldiers all over the world has made the use of this type of guns with 9 mm ammunition obsolete, even so the ammunition m/39B. The machine gun m45 has become a popular gun for competitions in Sweden and recently in the Baltic states. The gun has high precision. Very qualified shooters in civilian shooting clubs have been allowed to buy the m/45B for competitions. Smith & Smith / Small arms of the world.